Well wow. Just wow. While I didn't exactly dislike Glitch, it certainly left more to be desired. I found it to be an intriguing start to a series, but it wasn't exactly something that made me feel invested. Override, much to my surprise, was leaps and bounds better than the previous book, and set up the final novel of the trilogy perfectly. 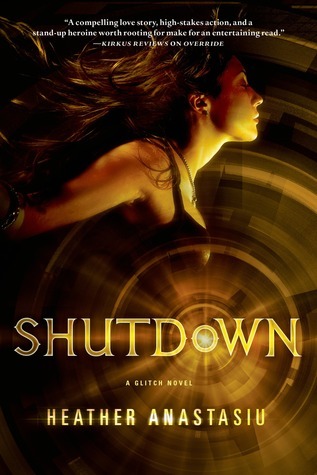 Shutdown blew me away, and I in now way exaggerate when I say that it is also blew its previous two novels out of the water. Anastasiu ought to pat herself in the back - not only did she give us such fascinating insight to her two main characters (because wow - did she peel off so many layers off both Zoe and Adrien) she also made sure that we'd be rabidly tearing through the pages, eagerly anticipating what else she has in store for us. I loved Zoe. Though we are in no way similar (come on, she's one of the leaders of a rebellion), I had no problem empathizing with her character. I've come to found out that most authors of dystopian novels have a difficult time making their characters relateable given that they live in a different time and a different world, but I never encountered that problem with Zoe. Anastasiu thoroughly fleshed out her complex character - from her despair of losing the Adrien she knew and loved, to her guilt of inadvertently causing countless deaths, and to her unflinching desire of saving her people and ridding everyone of the controlling government, and as a result, I had no problem connecting with her. I also loved how realistic Zoe's pain was - everything was heartfelt, and it was in no way overdone. Honestly, I actually found it difficult NOT to sympathize with her. I was also impressed with how Anastasiu explored Adrien's character development after he was unceremoniously lobotomized. The serious conversations between Zoe and Adrien - those concerning past Adrien versus current Adrien - were especially genius. Initially I was just frustrated at how Adrien was all robotic and seemingly had no feelings, but all that changed when he finally had the chance to convey everything that he wanted to say to Zoe. I couldn't help but feel sorry for him, and the same time, I found myself being able to relate to him. Just how often is it do we find ourselves being forced to be someone else because that's what other people expect us to be? I have never been a great fan of any dystopian series (yes, even the Hunger Games lost me as a fan after I read Mockingjay), but the Glitch trilogy is actually something that I will enjoy reading and something that I will recommend to my peers. Yes, it did have its eye-rolling inducing moments; yes, the first novel was pretty meh, but the sheer perfection of both Override and Shutdown allowed me to ignore the fact that I didn't really enjoy Glitch. So if you ever felt like giving up on this series because of Glitch - don't. DON'T. Trust me - you'll regret it. In summary (if you got tired of my endless gushing in the paragraphs above), I loved Shutdown. Anastasiu impressed me with her descriptive yet straight-to-the-point writing, her brilliant characterization, the action-paced plot, and most especially, I loved the ending. LOVED. Thank you for sharing with us. I have heard mixed thoughts about this series, but have to admit this is the first I really felt I wanted to jump in and get going. I am really excited to have a chance to win the series and reap what sounds like a great payout at the end of the journey. I don't really like this book. Maybe because it's not my cup of coffee. Looks very interesting. I might give a try one day.